Heat coals or gas grill for direct heat. Mix beef, bread crumbs, barbecue sauce and pepper. Shape mixture into eight 3-inch patties. 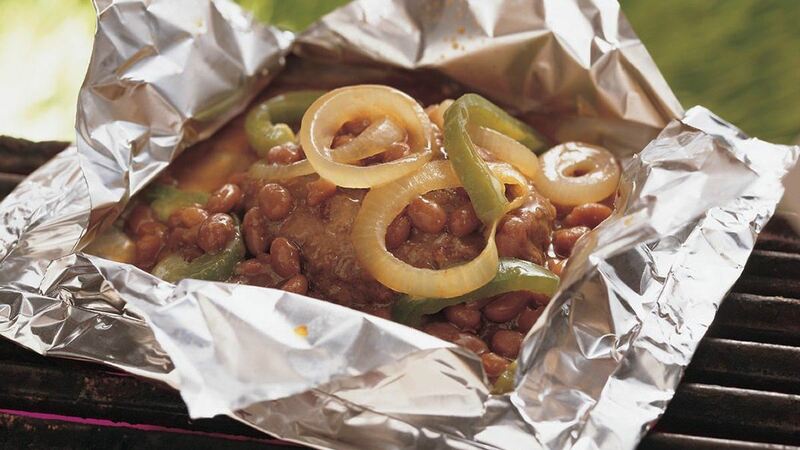 Place each patty on 18x12-inch piece of heavy-duty aluminum foil. Top patties with beans, onions and bell pepper, dividing evenly. Fold foil over mixture so edges meet. Seal edges, making tight 1/2-inch fold; fold again. Allow space on sides for circulation and expansion. Cover and grill packets, seam sides up, 4 to 6 inches from medium heat 20 to 30 minutes or until beef is no longer pink in center and juice of beef is clear. Place packets on serving plates. Cut large X across top of each packet; fold back foil.